FILE - South Sudan's President Salva Kiir addresses the nation from the presidential palace in Juba, July 9, 2017. South Sudanese judges said Friday that despite President Salva Kiir's decision to fire 14 of their colleagues, they will continue their strike until their demands are met. The judges went on strike May 1, demanding that Kiir increase their pay, improve working conditions and remove Chief Justice Chan Reec Madut from the bench for ignoring their demands. At a news conference in Juba, Justice Bold Lul Wang, chairman of a general assembly representing South Sudan's judges, said judges were shocked by Kiir's move, announced in a presidential decree Wednesday. "We are expecting the presidency should look into the problem which we submitted, because when someone comes to you to complain, you cannot punish the complainant. You have to answer his demand or say to him, I'm sorry I cannot help your demand,' " Wang said. 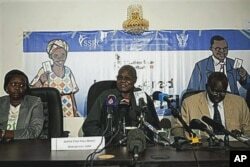 FILE - Chan Reec Madut, center, speaks during a press conference in Juba, Jan. 3, 2011. Wang said South Sudanese judges held an urgent meeting Friday in Juba and other towns across the country to talk about the fired judges. "The [judges'] general assembly has resolved to continue the general strike in solidarity with our honorable dismissed judges and justices until all our demands are met," Wang said. The judges are calling on the president to immediately reinstate the sacked judges and reconsider their demands. Wang said all judges stand in solidarity with their fired colleagues. "We are, therefore, placing the matter into the able authority of his excellency, the president of the republic, to either meet all our demands — including the immediate reinstatement of our dismissed honorable colleagues who have been championing our cause — or to dismiss us all who are on strike," Wang said. When Kiir fired the 14 judges, which Wang believes was recommended by Chief Justice Madut, he said the president did not follow proper procedure. "The president has the power to remove some judges, but through certain procedures which were not met. And in our humble view, we think that the chief justice has misled the president because he is the one to guide the president through the right procedure," Wang said. Most South Sudanese courts are backlogged with criminal cases because there are not enough judges to hear the cases and conduct trials.